Dover | Magnum Electronics, Inc. Custom installations and vehicle upfitting for public-safety/commercial customers has been a growing segment of our technical service offerings. We have formal agreements with emergency warning lighting, mobile video, rugged computer, LTE router, GPS fleet management, cabinet, and other manufacturers supporting mobile workers. We hold State of Delaware contracts for equipment and installation services along with the required insurance coverage. Below is a Chevy Tahoe our ETA certified upfit technicians completed recently. We also provide amber safety warning lights for construction and public works vehicles. Our Acari Drill-Free mounts can be used to mount beacons, work lights, and antennas easily without holes. To speak with our service team and request a quote call our office at 302-734-9250 during normal business hours. Located in Dover, we are an easy drive from anywhere in Delaware and most of the Delmarva peninsula. Wide-area digital 2-way radio communications is now available for commercial business fleets in Delaware and Maryland eastern shore counties. The Mid-Atlantic Digital Radio Network covering most of Pennsylvania and New Jersey, recently added tower sites for the DelMarVa peninsula. The system utilizes Motorola’s latest MOTOTRBO DMR digital technology that allows wide area roaming, group communications, and no need to change channels.. A business owner can now communicate with trucks anywhere within the digital footprint. The network supports the Motorola UHF MOTOTRBO XPR 5350 and XPR 5550 mobile radios for company-wide and private call voice communications. 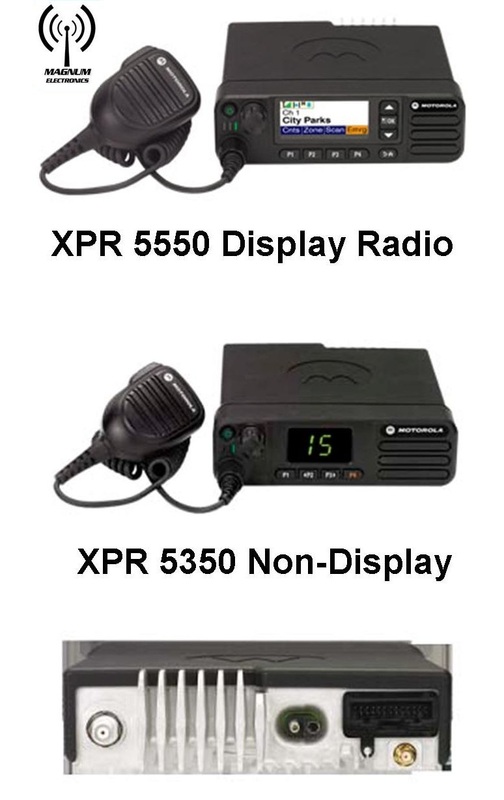 The XPR 5000 series supports the RLN6551 long range wireless speaker-microphone that allows the driver to use his mobile radio from up to 300 feet away from the vehicle. Text messaging, GPS fleet tracking, work order management, and other options can be utilized with this radio. Distracted driver laws put companies at risk who continue to dispatch their fleet using cell phones. Significant fines or worse can happen resulting in missed calls, voice mail messages, and decreased productivity. The Federal Motor Carrier Safety Administration ban on cell phone usage does not include mobile 2-way radios. The Motorola XPR 7350e and 7550e hand-held portable radios are also available and can be used as your base station if you are close enough to a tower. Depending on your location and coverage requirements, these models offer the same features as the XPR 5000 series. The MOTOTRBO digital network has been available for several years and is only new to Delaware and the DelMarVa Peninsula. Thousands of companies from coast-to-coast access MOTOTRBO networks at a low monthly fee per radio – all without having to invest in towers, repeaters, and ongoing infrastructure maintenance. Contact us for a monthly lease-purchase quote by calling our Dover, Delaware office at 302-734-9250 during normal business hours. We look forward to supporting your next generation wide-area fleet dispatch communications. Magnum Electronics, Inc., a leader in mission-critical wireless communications technology located in Dover, Delaware has been named a 2016 Empower Circle award winner by Motorola Solutions. This award recognizes the Top 50 channel partners worldwide for outstanding performance and customer service. The Empower Circle award ceremony will take place this month at the Ritz-Carlton on the island of Maui, Hawaii. Magnum Electronics is a wireless communications integrator, technical service center, GPS fleet management, and managed services provider supporting mobile workers in government and enterprise. The company has distribution agreements with Motorola Solutions, Vertex Standard, Cradlepoint, Panasonic, 3M Peltor, Federal Signal, and many other high quality accessory suppliers. Magnum Electronics is a Delaware state contract holder for emergency vehicle lighting, communications devices, and upfit installation services. The State of Delaware Government Support Services, Office of Management and Budget has published an award notice to Magnum Electronics for a statewide contract renewable up to five years. Delaware State Contract # GSS17626-ERVEH_WARN was a multiple source award after competitive sealed proposals were evaluated and best and final offers were submitted. The contract is intended to cover the State’s requirements for vehicle emergency and exterior lighting, sirens, prisoner cages, laptop mounts, consoles, gun racks, tool boxes, and any related equipment for supplying and equipping state agency vehicles. Types of agency vehicles include; police cars, ambulances, fire department vehicles, pickup trucks, utility vehicles, bucket trucks, dump trucks, construction equipment, ATVs, trailers, boats, buses, motorcycles, and bicycles. Magnum Electronics has been awarded the maximum allowable 20 contract catalogs including Acari No-Drill Mounts, Cradlepoint Vehicle Routers, David Clark Intercoms, Federal Signal Warning Lighting, Gamber Johnson Mounts, Globalstar Satellite Communications, GOLIGHT, J.R. Setina, Jotto Desk Consoles, Kussmaul Electronics, Lind, Magnetic Mic, Mobile Mark Antennas, Motorola Solutions, Panorama Antennas, Power Products, Rockland Custom Cabinets, Signal Vehicle Products, and Truck Vault. This segment of our business is growing rapidly and now our customers can purchase both fleet safety equipment and our installation upfit services using the GSS15735A-VEH_UPFIT state contract said Bill Ridenour, President of Magnum Electronics. Our Dover service facility is convenient and our experienced, ETA certified staff is proud of each installation. The Magnum Electronics contract code is GSS17626-ERVEH_WARNV08 using FSF# 0000004196. For more information visit the State of Delaware awarded contracts webpage. The State of Delaware Government Support Services, Office of Management and Budget has published an award notice to Magnum Electronics for a statewide contract renewable up to five years. Contract # GSS15735A-VEH_UPFIT was a multiple source award after competitive sealed proposals were evaluated and best and final offers were submitted. Delaware State Police specified Chevrolet Tahoe upfit packages for K9, marked, and unmarked patrol vehicles. The Department of Transportation (DelDOT) included various small to medium sized truck configurations. Installation requirements include emergency lighting, video equipment, wireless 4G mobile routers, automatic vehicle location, consoles, and laptop mounts. In addition to installation services, our contract includes Panasonic Toughbook computers and tablets, Cradlepoint wireless 4G routers, and Federal Signal emergency lighting, said Bill Ridenour, President of Magnum Electronics. Now public-safety agencies and public works departments throughout Delaware can purchase vehicle upfit services and equipment using a state contract. The Magnum Electronics contract code is GSS15735A-VEH_UPFITV04 using FSF# 0000004196. For more information visit the State of Delaware awarded contracts webpage. 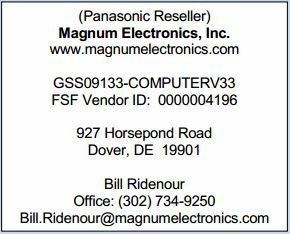 Panasonic has authorized Magnum Electronics, Inc to offer contract pricing and invoicing in Delaware on behalf of their agreement with the WSCA-NASPO Cooperative Purchasing Organization. The Panasonic Delaware contract includes Toughbook rugged, semi-rugged, and business rugged models. The popular Windows 8 and Android Toughpad rugged slate tablets including docks, external keyboards, and mounting accessories are available. Services are also identified supporting the Panasonic product line. The contract is available to all State of Delaware agencies, school districts, municipalities, volunteer fire companies, and political subdivisions. The Magnum Electronics contract code is GSS09133-COMPUTERV33 using FSF Vendor ID 0000004196. More information can be found on the State of Delaware website referencing contract number GSS09133-COMPUTER. Representatives from Panasonic and Havis will display the latest in mobile computing solutions at Magnum’s Technology Center this Monday, January 27, 2014. Stop by anytime between 4:00pm and 6:00pm for a close look at the latest mobile computers for public-safety and enterprise. A Panasonic product engineer will be here to address your technical questions and a Havis factory rep will show you the latest in vehicle mounting. 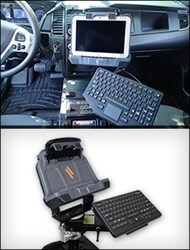 See the new Toughbooks and Toughpads with Windows 8 and Android designed for law enforcement, fire, and ems. Understand the different features and benefits for each model. This is a rare opportunity to learn, meet experts in the industry, and ask questions in a casual setting. Our technology “Happy Hour” style event starts at 4:00pm. Refreshments from our neighbor, Fordham and Old Dominion Brewing, will be provided. Magnum original crab cake sliders and other snacks will be served. We look forward to seeing you on Monday afternoon.